I'm planning to keep my boat at the local sailing club, what sort of cover is best ? boom up or flat ? There is no single correct answer, it's going to depend on your circumstances. Let's look at the pros and cons of each type. A "boom up" cover is designed to cover a boat where the mast and boom are left rigged in their normal positions. This is the most convient sort if from the point of view of minimizing the time it takes to get the boat ready to going sailing. Having taken the cover off, the mast and boom are ready to go, you only need to tension up the rig, rig up the sails and fit the rudder. The boom acts like a tent ridge, so in most places the cover is sloping, encouraging water to run off. It's only near the stern where the boom is resting on the transom that you get little or no slope and any chance of water forming pools on the cover. The disadvantage of a boom up cover that there have to be holes in the the cover for the mast, the shrouds, the forestay and there has to be a join running from the mast to the edge of the cover (normally from mast to forestay, sometimes from mast to shroud). Rain water running down the mast, shrouds or down the cover may find it's way into the boat through these holes and the join. The amount of water will depend on how well the cover is designed, how well the closeures are working, how waterproof the cover material is and so on. Some water is bound to get in. A "flat" cover is designed to cover a boat where the mast is taken down. As such it has no need for holes in the cover for the mast and shrouds. If the material is waterproof, and in good condition, it should be totally waterproof. It helps if the spars are stored such that one (normally the mast if you have a Gunter rig) forms a ridge along the middle of the boat, a little higher than the gunwales. That way water will run off and there is less chance of water forming pools on the cover. Another advantage of a flat cover is that the cover can be used when towing the boat to keep rain out and loose gear, sails etc in. The disadvantage of the "flat" cover for day to day storage is that, having taken the cover off, you now need to erect the mast and fit the boom before you can think about rigging up the sails. If your boat has simple rigging and with a bit of practice this should not take too long, but it's a job for teenagers or adults. If your boat has more complicated rigging (for example a spinnaker with a flyaway spinnaker pole), then there is a lot more potential for things to go wrong and you ending up with a cats cradle. Flat covers tend to be made from PVC and in time this will degrade due to UV light and lose it's plasticity and waterproofing properties. Overall a boom up cover is most popular here in the UK for use on boats stored at clubs. 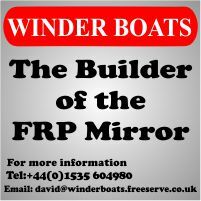 If your boat is fitted with a self bailer, then leaving it down with the boat level should allow most of the water that finds it's way through the cover into the boat to drain out again. This also means the cover material can degrade quite a bit before it has to be replaced. If you want young children to rig the boat without help, it's the only option. If you've a wooden boat with no self bailer, sail the boat infrequently and are happy to replace the cover at the 1st sign of it degrading (maybe every 2-3 years), then maybe a flat cover will suit you. Note that some companies (Trident for example) make a mast up flat cover. I think these are the worst of both worlds. There is no ridge formed by the boom, so typically part of the cover has a loop which is supposed to be attached to a halyard to prevent pools forming. Having taken the cover off, you need to attach the boom before you can rig up the sails. 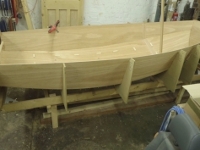 There are holes for the mast, shrouds and a join, so water can get in. In my view you are far better to buy a boom up cover instead.